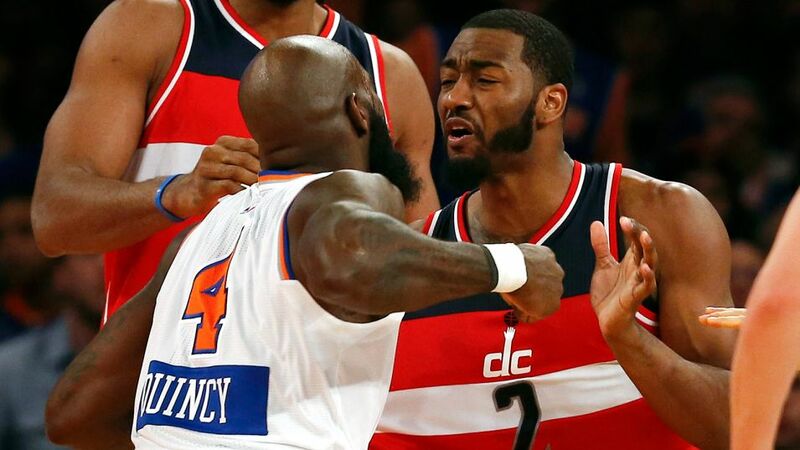 Knicks forward Quincy Acy has been hit with a one game suspension for his flagrant foul two on the Wizards’ John Wall during the fourth of quarter of yesterday’s Christmas game. The incident happened with 5:31 left in the game. Wall attempted to drive and was knocked to the floor via a hard shove from Acy, who then stood over the Wizards’ point guard. Wall rose and shoved Acy, creating a brief wrestling match. Acy was issued a flagrant foul two and ejected from the game. Wall was cited with a technical. NBA basketball operations president Rod Thorn also fined Wall $15,000 for the push. Acy will miss the Knicks’ December 27 road game againt the Kings. Meh. I think Acy just had enough to the Knicks’ futility and wanted to enjoy the rest of his Christmas. Enjoy your extended weekend, Quincy. And somewhere, Anthony Mason and Charles Oakley are rolling their eyes at that supposed flagrant.